Come Play! 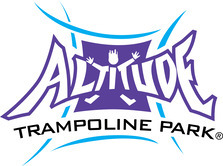 Altitude is Utah's newest trampoline park with wall to wall trampolines and attractions such as the Ninja Warrior Course, Tumble Track, Stunt Bag, Wipeout, Rock Wall, Battle Beam, Kids Court, Dodgeball, Foam Pits, Dunk Lanes, as well as a Main Court. Show your Utah Kids Club card for our special Buy One Admission Get One Free. *Trampoline socks are required and can be purchased on site. Altitude will even take your old, competitors socks, give you new ones and donate the old to those in need. Offer can not be combined with other offers. When booking a party, for birthday, church group, team party or any other, just mention Utah Kids Club to save 10% off your party. Then show your Utah Kids Club card when you pay to validate the discount.